Miffed at your latest engagement results? It might be time for a culture audit! 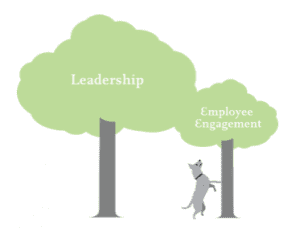 Can’t see the forest for the trees after years of measuring engagement? Identify three points of leverage that will transform your culture and engagement metrics and translate to improved customer satisfaction measures and business performance. For Human Resources and OD staff, the annual engagement survey can result in an overload of change initiatives that fail to yield an improvement by the time the next survey comes around. Too many companies apply band aids to engagement when they could be lifting the lid on culture. Culture is not really about behaviour – it’s about mindset. If you focus on changing behaviour at best you’re only going to get incremental shifts in culture. And even more importantly, it’s not about any mindset, it’s about leadership mindset! Your leadership culture determines how your organisation performs and behaves. Your culture will never evolve beyond the mindset of your leaders! We’ve spent hours decoding engagement results and developing culture action plans but as we all know, ‘being’ speaks louder than ‘doing’ and ‘doing’ is a long way in front of ‘talking’. Developing your leadership ‘being’ to handle more complexity and to be more creatively in flow rather than stuck in reactive patterns will do so much more for your engagement scores. If you’re interested to know more about how a culture audit could reveal the forest for the trees, let us know and we can share how this approach is working for our clients. Get in touch – give us a call or drop us a line to see whether what we do is right for you and your company.